1. Trade war fears: A measure of calm has returned to global markets. But for how long? 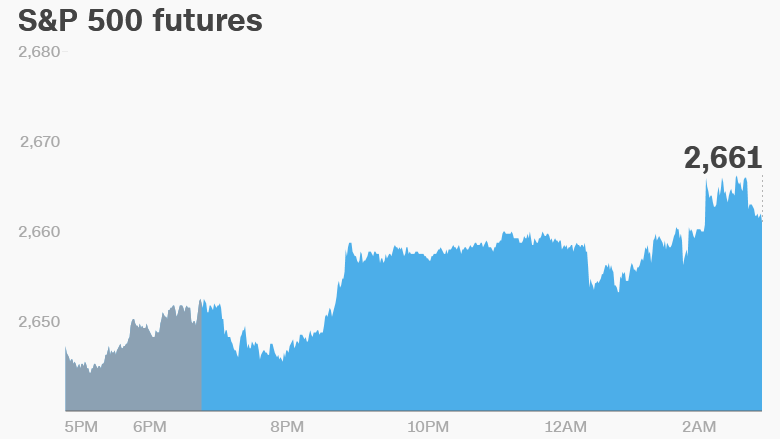 US stock futures were higher on Thursday, and most global markets posted gains in excess of 1%. The positive mood follows days of volatile trading driven by a quick-fire exchange of threats between the United States and China. Investors fear a full-blown trade war could erupt. Experts say the latest threat from China -- a plan for tariffs on $50 billion worth of US exports -- could be an effort to push the United States into negotiating a deal to defuse the trade spat. The Dow Jones industrial average closed 1% higher on Wednesday, reversing huge losses from earlier in the trading session. The S&P 500 added 1.2% and the Nasdaq gained 1.5%. 2. Facebook's data problem: Facebook (FB) has revealed that Cambridge Analytica, a data firm with ties to President Donald Trump's campaign, may have had information on about 87 million of its users. Previous reporting had put the number of people whose information may have been shared at around 50 million. Cambridge Analytica disputes the figure. Australia launched a formal investigation into Facebook on Thursday after the company revealed information about hundreds of thousands of Australians was potentially exposed. The data scandal has raised questions about the social media company's business model, and the leadership of CEO Mark Zuckerberg. 3. Global market overview: European stocks opened firmly higher on Thursday. Benchmark indexes in London, Paris and Frankfurt all gained more than 1.5%. Japan's Nikkei added 1.5% and Korea's Kospi increased 1.2%. Markets in China are closed on Thursday and Friday. Oil gained 0.3% to trade at $63.50 per barrel after a report showed a decline in US crude stocks. 4. Earnings and economics: Monsanto (MON) will release earnings before the open. WD-40 (WDFC) is up after the close. The US Census Bureau will release trade balance data for February at 8:30 a.m. ET. The Department of Labor is set to publish jobless claims statistics at the same time. The US jobs report for March will be released on Friday. New data show car sales in the United Kingdom slumped 16% over the previous year in March. Diesel sales slumped 37%. The Reserve Bank of India will issue a rate decision on Thursday.